The Goodfellow name goes back a long time in this area. Our own Chris Goodfellow, who now lives here with his wife Penny, is the grandson of Reverend John C. Goodfellow. He writes us to say thanks to the people behind the recent placement of signs marking Goodfellow Creek on the Hope Princeton highway in Manning Park. This honor of his grandfather was particularly facilitated by Area `H` Director, Brad Hope and Ms. Anne Hazlewood, Area Manager, Department of Transportation and Infrastructure. The creek was named after Reverend John C. Goodfellow D.D. (1890-1968) in the early 1950`s by then-park ranger Robert Boyd. John Goodfellow resided in Princeton for many years and served as United Church Minister at St. Paul`s United from 1927 until his retirement in 1958. He was very active in the community with a special interest in local history, working closely with the BC Historical Society. In 1958 `The Story of Similkameen` was published and, although now out of print, his work is still considered to be an accurate and well documented account of the valley`s timeline and events. The connection to Manning Park stems from a boys group that Rev. 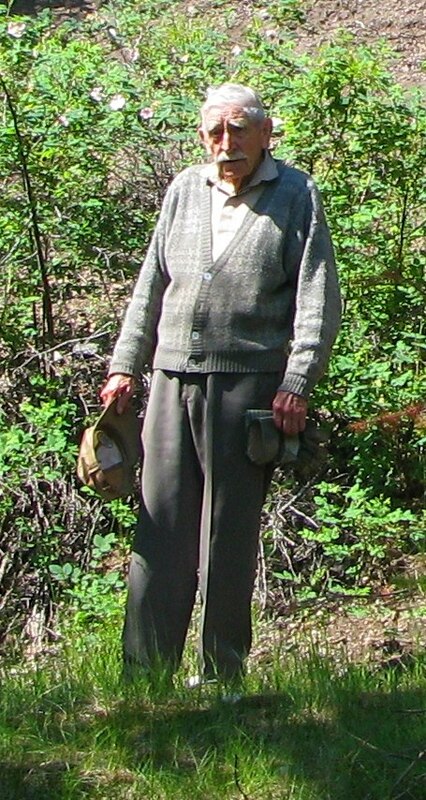 Goodfellow mentored through the church and each year he would lead them on a hike over the Dewdney Trail to Hope. He completed this nineteen times from 1927 to 1946. Goodfellow Creek was always a favourite stop for a drink of water by John Goodfellow in his later years, and it was surely reminiscent of his many hikes over the mountains there. It is official! The RDOS Board has passed a resolution to place the Granite Creek ghost town on the Heritage Register for Area H. Special thanks to Lindsay Bourque of RDOS for her hard work. Lindsay provided us with information on how to prepare a Statement of Significance which was needed for the Board presentation and then she patiently advised us on amending and editing the Statement. Lindsay then added this subject to the RDOS meeting agenda to be voted upon. We are so very grateful to her. Without her help this could not have happened. What does this mean? Placing a site on the Heritage Register does not protect the site. It formally recognizes Granite Creek as an historic place. Having Granite on the Historic Register will “enhance the public’s appreciation of the identity and character” of the town. So now what happens? Lindsay explained she must provide notice to the province within 30 days. After that we are hoping applications can be made for funding for interpretive signs to be placed in the town. High on our wish list is to get RDOS to turn the Granite Creek ghost town into a park; however, that will be a massive undertaking by our area representative which could take years to complete. For right now we can all rejoice in the fact that our 1885 ghost town called Granite Creek has officially been recognized as an historic place. It’s definitely the last of fall when there’s snow that sticks. However, this doesn’t even come close to reaching the record of 24.1cm on this same October day in 1945 and there’s still a few warmer days to come. On the south side of the bridge at the end of Betts you will now see a new sign. To the left is the old Blakeburn Road sign, but on the right, bearing what Coalmontians and the Smart family believe to be the rightful name – SMART ROAD. Walt Smart was born in Coalmont in 1923, ran the Coalmont General Store from 1950-1972 and the Emporium from 1972-1976. At that time he moved five kilometres up the south side of the river and lived there until he passed away in 2010. The road leading to the house that he built has always borne his name. However, to commemorate this important figure in the history of Coalmont, Diane Sterne thought that the name of the road should be formalized, and so went about to ask the district what they could do. As it turns out, the Regional District didn’t feel they could do anything without more formal input from the family, and unfortunately the Ministry of Transport will not sign as the road is classified as a forestry access road. We who live here can nevertheless take our own action, and so Diane and Bob went out and purchased a sign which Ernie Rice was kind enough to install. Although it was generally referred to as Walt Smart Road in the past, it was decided at a Coalmont Community Association meeting that the name be shortened to Smart Road so as to include reference to Mrs. Smart which is what the family indicated Walt would have wanted. The venerable Coalmont Hotel is now in it’s 100th year and just keeps on going. Michelle Cole and partner Gerry Hampton are now living in the hotel and working hard to ensure that the establishment not only stays open, but that visitors will have the historical experience that this landmark is known for. As most know, on December 30 Maurice Chartrand, his sons Mike and Shane, and Ray Michaud all jumped in to save Bob Sterne’s life when he suffered sudden cardiac arrest (his heart stopped). Their quick actions brought him back to life with no lingering effects. Volunteer Firefighter, Jodi Woodford, showed up with much needed oxygen until an ambulance arrived. Two ambulances came and paramedics quickly loaded Bob onboard and took him to the Princeton hospital where Doctor Eva and a great team of nurses rushed to stabilize him for his ambulance ride to Penticton. One of the nurses rode with Bob all the way to Penticton in case he suffered a second cardiac arrest. Daniel Lawrence Rice was born on September 25, 1926. He was the 5th of 6 children born to Effie and Ernest Rice coming into this world at Roany Creek Ranch where Ernie Rice now lives. Dan suffered failing health over the past several months and the end came June 2nd (2011) at his home in Granite Creek where he wanted to be. Grace cared for him with tender love and affection to his last breath. The family being there with him also. Dan had a full life; he had to walk 5 miles each way to school. When he returned home had to milk the cows, feed the pigs and chickens. At 10 years old he had to go with his father and uncle back to Mt. Outram where they had placer mining claims and bring 8 horses back to the farm. 6 weeks later Danny had to take the horses back by himself to pick up supplies and samples. His dad and uncle would be with him on his return. At the young age of 14 he lost his father to silicosis and then had to be the man of the land – being responsible for all the farm work. In the Winter months he hunted cougars for the bounty posted by the Cattlemen’s Association. He raised a cougar kitten until he couldn’t keep it and sold it to Game Warden Alan Gill. Later, with his brother they build a sawmill running it for several years. He bought the property at Granite Creek when he was 18 and paid for it over time by cutting and selling firewood. In 1954 Dan went logging in the Christina Lake area for a time and then moved on to Rock Creek, working as a sawyer and millwright in an operation there. From Rock Creek he moved to Lumby working in his brother-in-law’s mill for a couple of years before moving to 100-Mile House. He worked in 27 different mills. In 1958 Dan came back to work for his brother Gene and moved to Granite Creek in 1960 living in a 2 bedroom cabin until he built the house in which they have resided ever since. This was the home where Dan and Grace raised their family. They have resided there 51 years. Dan’s ventures included gold mining, trapping, fishing, hunting, logging and farming. They had a lovely vegetable garden which required a lot of work from both Dan and Grace. Danny and Grace married in 1954 but didn’t have time then for a honeymoon. So 40 years later they travelled to the Yukon for a wonderful holiday, and Grace said it was worth waiting for. Aside from all his other ventures, Dan loved to play the guitar and sing – entertaining his family, friends and guests. Dan Rice will be sadly missed and fondly remembered by his loving wife Grace of 57 years, 2 sons, Brian, and Albert and his wife Lori; 2 daughters, Leona and her husband Ken, and Jackie and her husband Jesse; 8 grandchildren as well as numerous nieces, nephews and cousins. He was predeceased by daughter Georgina, 2 brothers, Ernest and Eugene; 3 sisters Agnes, Marie and Sylvia; as well as both his parents Effie and Ernest Rice. Coalmont was buzzing on Saturday. The big tent was set up on the corner of Parrish and Columbia. The BBQ was manned by Terry and Bruce who, with help from Marianne Slaeger and others, pumped out the hamburgers until they ran out in the afternoon. The smell must have wafted all the way to Princeton, because there were a lot of visitors. In fact Terry Malanchuck, who keeps track of these things for the Blakeburn reunions and can recognize where most locals come from, says he counted over 200 coming through, and believes there were almost 300. Others say around 150 but either way, for our little town, that is extraordinary! It is rare to see that many people all together in this community. In fact, there probably hasn’t been as many gathered here since the 30s! The Coalmont centennial was indeed well marked. 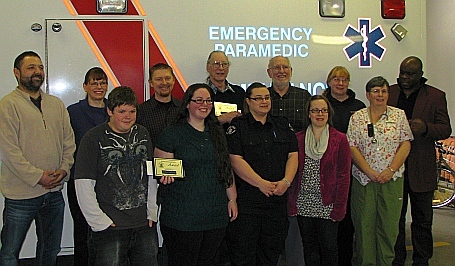 All this was possible thanks to Coalmont Energy Corporation who sponsored the event. Steve Dimond from CEC was on hand and in addition to giving a dinner speech about how this sponsorship came about, provided music with his portable sound system. Many people in Coalmont put in a good effort here, but the star was definitely Lillian Young who organizes the annual Blakeburn Reunion and pulled together our Centennial Dinner with skill and grace. Lillian was born in Coalmont and grew up here in the 20’s and 30s. She has a lot of history here and can even remember MacTavish, the General Store proprietor, pulling the kids’ sleighs around with his new motor car – yes, times have changed. As well as curious visitors and newcomers, there were quite a few old-timers such as Evelyn McCallum (left) and Edith Rice, pictured below. Evelyn is one of our local historians for the Princeton area and was recently awarded the first honorary life membership of the Princeton and District Museum and Archives. Edith we all know here. She has a long history in this area, including coming to Coalmont in the 40s and working the Roany Creek Ranch. There were many others from the old days, too numerous to mention, but it was fantastic to have them all here. One of the features of the party was a display of historical pictures supplied by Bob and Diane of the Mozey-On-Inn. These proved to be very popular and they occupied many people’s interest. Terry Malanchuck spent a lot of time answering questions about them. At the end Bob came and announced that anyone could take one of the photos home, which made quite a few people very happy. The New Coalmont Courier also provided a little commemorative history flyer with a picture of the tipple on the front for people to take home and save as a memento. To complete the memorabilia, there were buttons and T-shirts available at the Coalmont Kiosk which had it’s grand opening this same day. It was June the 6th 1911 when the Columbia Coal and Coke Company registered the town plan in Kelowna. After getting off to a rocky start because of the intervening First World War, Coalmont took off and, as advertised, became “the centre of the coal and mining belt and the hub of business enterprise in the Tulameen valley”. Our little town thrived until the mine (by then in Blakeburn) closed in 1940. We nearly became a ghost town, but we’re still here! Visit WWW.COALMONTCENTENNIAL.COM which was set up to commemorate our centennial. There you will find a pictorial “then and now“, links to more detailed history, and a GUESTBOOK for anyone to sign. The Guestbook has already garnered a few interesting stories and hopefully before the year is out will become an interesting little narrative. If you live here, grew up here, have visited here, or are simply a Coalmont wannabe, please add your two cents worth. We have confirmation that there will be a celebration on Saturday July 9. Everyone is invited. This party is made possible by the generous sponsorship of the Coalmont Energy Corporation. More details to follow. This is our museum too. In fact the new Operations Manger is Coalmont’s own Sharon Anderson. The Princeton Museum was established in 1958. It was known as the Princeton Pioneer Museum before being renamed the Princeton and District Museum and Archives. Archival holdings include records of individuals and local organizations, mining reports, maps and photographs relating to Princeton and area including Tulameen, Coalmont, Granite Creek and Manning Park. Holdings also include an extensive biography file and newspapers. Inclusive Dates: ca. 1900 to present. Museum collection includes an extensive collection of fossil wood and rocks. The Princeton & District Museum and Archives is currently in the process of renovating the existing building to expand into a portion of the building formerly occupied by the Town of Princeton Library. The executive and membership are excited about the challenging months ahead and the prospect of serving the public even better. The renovations will offer additional display area and an overall facelift to the museum. A grand reopening is planned for this summer. Diane Sterne is the proprietor of the Mozey-On-Inn motel in Coalmont, and a devoted historian of the area. 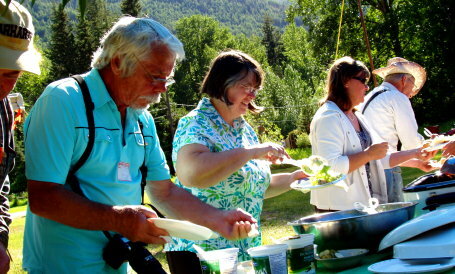 She and her husband Bob take pride in the work they have done uncovering the history of Granite Creek and Coalmont and encouraging tourism in the Tulameen River valley. Diane’s new book White Gold and Black Diamonds is the culmination of six years of research. In 1885 Gold Fever lured men to the previously unknown Granite Creek area. Within one year a town of approximately 2,000 sprang from the forest floor. Today, little remains of this bustling gold town. Only 26 years later with the discovery of coal, the town of Coalmont sprouted nearby. 2011 will mark Coalmont’s 100th birthday. White Gold and Black Diamonds has been written in celebration of this auspicious event. 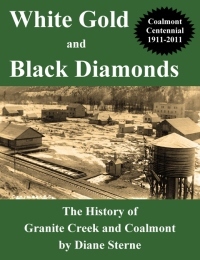 Honouring the sister towns of Granite Creek and Coalmont, this book preserves their little-known history. The book recounts stories of oldtimers like Butch and his pet pig; Robert Stevenson, the prospector who buried his friend’s wife four times; and Hattie McBride, the woman of “negotiable affection” whose unsolved murder has left her restless spirit wandering the area. This book is 178 pages, and contains 155 photographs (many of which were previously unpublished) plus old business advertisements gleaned from publications of the day. Tom Stout passed away on the last weekend of January and we send our condolences to family and friends. Walt Smart, who was born in Coalmont in 1923, passed away in the Kelowna hospital late Friday night. Walt’s history in this area goes back to the original Granite Creek gold rush. He has left a big mark on Coalmont and his passing touches all of us. Old timers have fond memories of Walt’s store and his other community interactions. Newcomers knew him as a gentle man who was full of information and always great company. Tourists will know him from his famous signs. In fact, Walt’s sense of humour is famous. If you “dig history” it’s time to join the Princeton Museum Society. Our Museum has undergone many transformations over the decades – from its early years in a log cabin to the building it is in today on Vermilion Avenue. Until now, the Museum has shared its accommodation with the Library but all that is about to change. This year the Library moved to a new location and now the Museum is ready to undergo a major face-lift. What was the old Library, will become the Gloria Stout Wing named in honour of Mrs. Stout who left a generous bequest to the Museum she loved. The Museum will be closed until renovations are completed in 2011, but there is much to do. Decisions must be made, display shelves and cases purchased, and a general reorganization and cataloguing of the entire collection must be tackled. When completed, the famous Joe Pollard Collection of fossils and fluorescent minerals will have an updated home complete with black lights. The bar and gaming machine from Granite Creek will be properly displayed for all to see, and the entrance to the Museum will be magnificent. After walking through the main front doors, guests will move to their left where they will enter an area resembling a mine tunnel. The new Museum will house a meeting room where researchers can access the extensive Archives available. Archival material will be organized in the basement of the new Museum and an elevator will bring material up to the meeting room. The entire building will be updated with modern climate controls that will help protect the fragile contents inside. There will even be a unique gift shop. This past summer, Coalmont’s own Sharon Anderson was appointed Manager of the Princeton Museum (replacing Nick Mills). She brings with her an extensive background ranging from accounting to experience applying for government grants. Her new position will be a challenging one that will involve hiring and overseeing a staff of summer students and keeping her finger on the pulse of the new Museum, but we are confident with her abilities and excited to have her on board. Important Update: At the 14/09 museum meeting, it was decided to change the meeting times. The next meeting will be Wednesday, October 20 at 7 p.m. It was agreed that we might get a better turnout if we move the meetings to the evening. The meetings will now be held on the 3rd Wednesday of every month (excluding July and August) at 7 pm in the basement of the Princeton Tourist Information Centre. The next meeting of the Princeton Museum Society is Wednesday, February 16 at 7 pm in the Meeting Room of the Princeton Library. The AGM is Wednesday, March 23 at 7 pm in the Meeting Room of the Princeton Library. After much hard work, Diane Sterne has recently completed a book on the works of Susan Allison. She has donated the copyright to the Princeton Museum so that they will benefit from the proceeds. 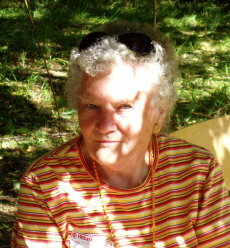 In Her Words is a collection of selected works of Susan Louisa Allison (née Moir), Mother of the Similkameen. Her poetry and stories (some of which were written under the pen name of Stratton Moir) recount Indian legends told to her in the 1800’s when she ventured into the British Columbia interior with her new husband, John Fall Allison. Many of Susan Allison’s works have disappeared over time. With the assistance of members of her family and the Princeton Museum, this collection of lost writings has been carefully preserved. Included are: “In-Cow-Mas-Ket” and “Quin-Is-Coe”. This book has been prepared in celebration of Princeton, B.C.’s 150th birthday and the proceeds will benefit the Princeton and District Museum and Archives. BC Day is a statuary holiday and happens every year on the first monday of August. Everyone heads out to the country and has a roaring time enjoying this wonderful province. Just for the fun of it, let me fill you in on a bit of BC history. First, our name hasn’t always been British Columbia. We actually started out as New Caledonia. New Caledonia was the name given to a district of the Hudson’s Bay Company that comprised the territory which was largely the same as our province. It was part of the British claim to North America, but not a British colony. New Caledonia continued to be administered by the HBC with the govenour of Vancouver Island, James Douglas, as the chief executive. There were only about 100 people in the area, but when the Fraser Canyon Gold Rush started at Yale, there suddenly came an influx of over twenty thousand people, mostly American. This compelled Douglas to exert British sovereignty by placing a gunboat at the mouth of the Fraser River in order to obtain licence fees from prospectors. The British colonial office was thus prompted to pass legislation designating New Caledonia as a crown colony on August 2, 1858 – and that’s when we got our new, and current, name. However, it wasn’t until 20 July 1871 that British Columbia became a Province of the Dominion of Canada. The history of our flag, or flags, is also interesting. It wasn’t until 20 July 1960 that we got the “wavy white and blue with rising sun” that we have now. In fact there were several flags. Part of the history of our crest, upon which our flag is based, is quite amusing. When British Columbia became a province of Canada, its first proposal for a coat-of-arms and flag was a half-sun in the top half and a Union Jack in the bottom half. When the design was sent to the heralds in the United Kingdom for approval, they became appalled when they realized that the design could be interpreted as “the sun setting on the British Empire.” The design was quickly reversed so the sun was on the bottom like we see today. There are still a few examples of the original faux pas around. A stained glass window in the Provincial Parliament Buildings is one. When we became a province in 1871 the flag one would have seen on any vessels operated by the Province of British Columbia would have been the Blue Ensign with the badge of the Dominion of Canada. The problem in those days was that we didn’t yet have and official flag. Therefore the earlier flags always looked a bit contrived. The flag at the beginning of this article is the 1870 colonial flag. The one below, is the one we got in 1960. So, a lot of water has gone under the bridge, and here we are with a new name, a new flag, and a couple of days off work. Life is good. Enjoy your holiday!